2 Why is this Wiki Important? 3.1 What is Down syndrome? 4.1.1 What is the Problem? 4.1.3 What Can You Do? 4.2.1 What is the Problem? 4.2.3 What Can You Do to Help? 4.3.1 What is the Problem? 4.3.3 What Can You Do? 4.4.1 What is the Problem? 4.4.2 How Can Being Physically Active Help? 4.4.4 What Can You Do to Help? 4.5.1 What is the Problem? 4.5.3 What Can You Do to Help? 4.6.6 What Can You Do to Help? 4.7.1 What is the Problem? 4.7.3 What Can You Do? 6.3 Does This Make the Transition Perfect? 6.5 How Can You Make the Transition Easier? Welcome to our information page! This resource is intended for families and carers of persons with Down syndrome (DS). When a person has DS, it is common for family members to seek out information to better understand the unique challenges they may face and to prepare for the future. There is a large amount of information available regarding Down syndrome, some of which can seem overwhelming and intimidating. The purpose of this page is to consolidate and clarify information found in current literature and to provide families of persons with DS with a comprehensive, easily understood learning tool which they feel confident in consulting. This page further aims to educate families about what to expect throughout the life of an individual with DS, ease concerns, and highlight the role of physiotherapy in the care and management of DS. After reading this page, it is the hope of the authors that readers will feel encouraged and confident, allowing the family to better manage at home. We hope that families will be better able to understand when and how to seek professional guidance and additional support, should they require it. Why is this Wiki Important? DS is the most commonly occurring chromosomal variance noted world-wide , with 1 in 700 births resulting in a child with DS . 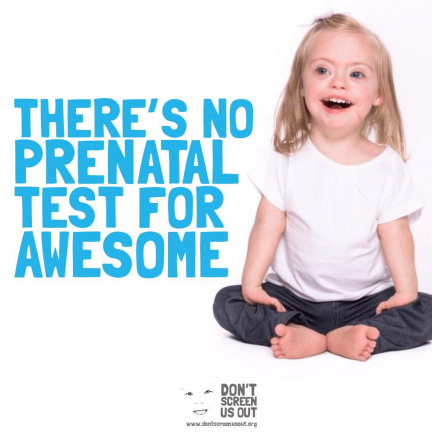 In the UK alone, there are over 41,000 people living with Down syndrome, and 750 new people born with DS each year . Birth rates are expected to stay the same, but the total population of persons with DS is expected to rise in the coming years. This is mainly due to medical advancements which have increased life expectancy from age 9 in 1929, to 60 years of age today . With this increase in number and age of this population, there will be a larger demand on health services, such as physiotherapy, and increased challenges for families to overcome. Additionally, persons with DS already report having problems gaining access to health care  with the main barrier being a lack of knowledge about available services . Furthermore, parents of persons with DS also commonly express feeling stressed and uncertain about surrounding care of their child and state that they desire more help from physical activity specialists regarding both education and available interventions . As members of the healthcare team commonly consulted regarding the care of persons with DS, physiotherapists will be affected by this population change. Physiotherapy will play a large role in the care of persons with DS and families will often spend long periods of time at appointments to help their child. The authors believe that understanding basic physiotherapeutic techniques and exercise principles will help parents feel at ease and provide maximum benefit for their child. This wiki is therefore a necessary educational tool for families to consult whenever they are looking for answers or reassurance. It will also identify what is to be expected over the lifespan of a person with DS and common misconceptions, as well as how families and individuals can best self-manage at home. Lastly, this resource will highlight potential complications and provide external resources for family members should they require assistance. Before going any further the authors recommend watching this “Ted Talk” given by Karen Gaffney, a person with Down syndrome. Karen explores numerous contemporary thoughts surrounding DS and challenges society's preconceptions of people with DS. The authors believe this video provides an inspiring message of positivity that this page hopes to expand upon and pass on to you. REMEMBER: Stay positive! Everybody is unique. These conditions are common in DS but are only possibilities, not inevitabilities. Though there are many similarities across the DS population, there is great variation in the syndrome. There are three types of DS, each with its own set of challenges and individual variation. The three types of DS are Trisomy 21, Translocation and Mosaicism. Further information on the differences between categories can be found here. Whichever the type, persons with DS typically have poorer overall health at a young age and exhibit a greater loss of health, mobility, and increased secondary complications as they age when compared to their non-DS counterparts . As a result, persons with DS and their families frequently access a range of health services, including physiotherapy. Physiotherapy is a science-based profession that considers all aspects when approaching a persons health and wellbeing. Through movement and exercise, manual therapy, and education physiotherapists aim to empower people to take charge of their own health and participate in their treatment. Physios will typically assist individuals with injuries and a range of disabilities to develop to their fullest potential and live as independently as possible . These will be discussed in more detail below! From the time a child is born, they are growing and learning. Each person develops at at different pace. However, some skills are expected to be mastered by a specific age. These are called developmental milestones. Milestones can be physical achievements, language related, or social accomplishments. As physiotherapists, we typically focus on motor skills . 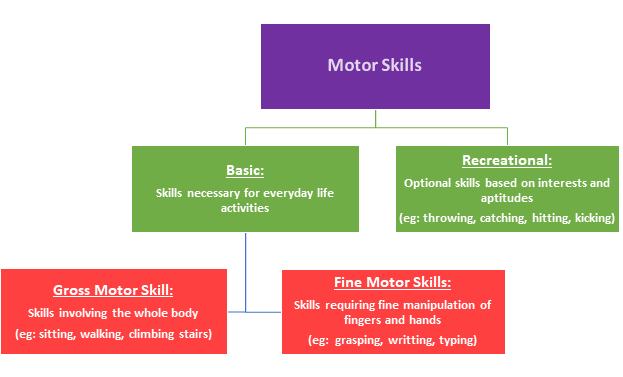 Motor skills are key for physical function, but also impact cognitive development. Reaching and grasping allows a child to explore the characteristics of objects in his or her physical world. Sitting promotes the use of arms and hands for playing. Walking allows a child to explore the world more effectively than crawling. Independent movement increases opportunities for social interaction which promotes language learning . For more in depth developmental milestone charts, please see here, and if you would like further description of milestones or to track your child’s progress at home, please see the checklist provided here. While these milestones are generally agreed upon, studies targeting developmental milestones tend to only examine a small number of people. This makes the information less representative of the entire DS population. Researchers also commonly compare people with DS to their non-DS counterparts of the same age. This is an invalid comparison, and it would be more correct to compare children with DS to non-DS individuals of the same mental age. Despite these limitations, the above listed milestones are widely used and considered accurate . Physical characteristics of the child with DS such as low muscle tone, loose joints and decreased strength may influence the speed of mastery or alter the form of the developmental milestone. Persons with DS generally naturally overcome these challenges through perseverance . The goal of physiotherapy is not to ‘speed up’ the rate of development. It is simply to facilitate the development of optimal movement patterns. Depending upon capabilities and adaptations made, physical compensations such as pain or inefficient walking patterns may occur. Physiotherapists are here to help with that! 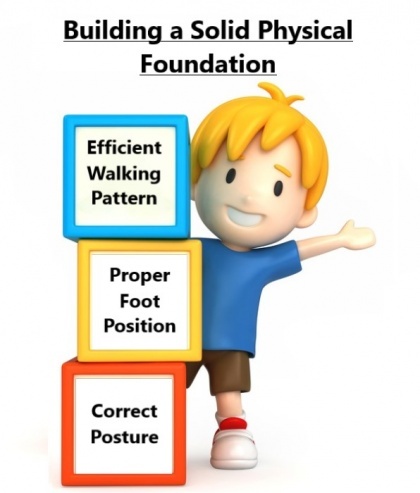 When considering motor skills in DS, the goal of a physiotherapist is to provide the building blocks to develop a solid physical foundation for movement and exercise that your family member can build on for life. Physiotherapy sessions focusing on developmental milestones will be specifically tailored to your child’s current level of development. The physiotherapist will observe your child’s abilities and determine what skills should be learned next. As each person is different, skills will be taught in the way your child learns best. It is common for tasks to be broken into smaller parts and practiced using different methods based on individual learning styles and physical make up. REMEMBER: When thinking about developmental milestones, the journey to get there may be different, but the destination is the same! As mentioned above, it is common for children with DS to be delayed in reaching common milestones such as sitting independently, standing and walking. One of the contributing factors to the delay of these specific milestones is poor balance. It is well known that persons with DS are often considered floppy, clumsy, uncoordinated and have awkward movement patterns due to balance issues. These balance challenges often follow the child into the teen years and sometimes into adulthood . While impaired balance is difficult on its own, it may also impact development of other motor abilities and cognitive development. Being able to maintain balance allows for exploration, social interaction and overall freedom . This highlights the importance of physiotherapy involvement in the child’s life so that the issue can be addressed. Loose Ligaments: Persons with DS have elastic/loose joints, allowing for a large range of movement. Although this doesn't sound like a problem it can lead to joints being less stable, difficult to control and may affect balance. Low Muscle Tone: A common symptom of DS is a ‘floppy’ appearance of limbs, with little activity in the muscles at rest, impacting stationary balance. Floppiness does improve over time but can influence balance greatly in early years. Slow Reaction Times/Movement Times: Persons with DS often are slower to react and move than their non-DS peers. This means that even if the person feels unsteady, it will take a longer time to react to this feeling, and once it is understood, the corrective movement will also be delayed. Both of these aspects make balance challenging. Differences in Brain Size: Persons with DS typically have smaller cerebellums, which is a part of the brain that contributes to the control of balance. The small size impacts its function, limiting balance reflexes, and causing blurry vision when completing tasks at high speed. Other parts of the brain are also smaller, creating issues with voluntary activities, walking technique and coordination. Decreased Postural Control: Typical posture in a person with DS is hunched over, with a rounded neck, which prevents the head and body from sitting over the pelvis. Posture is impacted by inaccurate messages being sent to the brain from the body’s sensory system. This leaves people with DS less capable of adapting or making anticipatory adjustments to changing environments . REMEMBER: If you notice these qualities, do not worry. This is to be expected and can be improved upon with practice and patience! There are a wide range of physiotherapy interventions that can help your family member improve balance. Some of them have been used for many years, while others are still developing and being introduced. These emerging physiotherapy techniques will all be discussed later! Practice Makes Perfect: As with everything in life, practice will improve performance. While it often takes more practice to improve performance of balance in a child with DS, it is possible to increase both speed and accuracy of movement. Encourage Independent Movement: When a person actively initiates a movement, the brain learns how to control the area being moved. This improves coordination and task performance. Follow Individual Interests: Your child is more likely to eagerly participate if the activity is one that is enjoyed. Try incorporating balance training into sports and games. The Earlier the Better: Starting balance practice early in a child’s life will allow for greater amount of learning time and increase muscle strength at a young age. It’s Never Too Late: Though it is harder to correct learned bad habits, practice at any time is helpful. It is never too late to start. FUN FACT: Individuals with DS are more commonly visual learners. This means that they learn better by watching others or copying what they can see rather than responding to verbal instruction. Copy cat is a great game to help teach your child new tasks ! Another contributing factor to delayed milestones and common challenge with DS, is decreased strength. During childhood, children with DS do not experience the same amount of muscle growth or strength increase as their peers without DS . This is in part due to the decreased amount of physical activity experienced by people with DS, but is also caused for unknown genetic reasons that research is still investigating. Regardless of the reason, persons with DS consistently fall behind in strength categories when compared to their peers without DS, individuals with DS typically exhibiting 40-50% less strength . Start early: being aware of the issue is the first step. If intervention is introduced at a young age, it is possible to avoid later complications. Do the exercises with your child. Incorporate strength training into things your child enjoys . REMEMBER: More practice means more benefits. Encourage exercise as often as possible, but be sure to consult your physiotherapist for advice on exercise safety! The research on physical activity levels in people with Down syndrome is conflicting. However, most research does find people with Down syndrome to live highly sedentary lives in which they do not achieve the recommended guidelines for physical activity levels . Furthermore, as people with DS age, their physical activity levels fall even further behind their peers without DS . This trend demonstrates that reduced activity levels are a lifelong issue for children with DS that must be addressed. FUN FACT: Did you know that the daily recommended levels of physical activity for children is at least 60 minutes of moderate to vigorous intensity activity? Similarly, adults should participate in at least 150 minutes of moderate aerobic activity each week, including at least two strength session in the week . Although people with Down syndrome may have decreased capacity for exercise compared to their peers without DS, the guidelines clearly state that children with DS should still meet the recommended guidelines or do as much physical activity as they can manage . Take a moment to consider how active your child has been over the past week. Do you think that the recommended daily activity levels have been met? If yes, then great! However, if not, take the time now to think of why this is happening. Are there specific reasons that you can identify that are getting in the way of or preventing your child from being physically active? Most individuals with Down’s Syndrome have to overcome social and environmental barriers to access physical activity. As discussed above, poor strength and balance are limitations to both cardiovascular and resistance exercise. This however needs to be changed as many individuals with DS are now being classed as obese. People with DS face many obstacles with the main barriers being lack of money, transportation, access to programs and support from family and carers. It is a common thought that people with DS are too fragile to participate in exercise. This is not true, and it is important that parents and caregivers believe in their child and encourage them to be physically active . Individuals with Down syndrome have been found to have substantially higher rates of obesity compared to the general population .Often occurring early on in childhood, obesity was found to remain stable from childhood into adulthood, with slight increases after puberty . Obesity is now recognized as a major health risk for people with Down syndrome . The causes of obesity in the Down syndrome population can be divided into physiological causes and behavioural causes. Physiological causes may include conditions such as hypothyroidism, decreased metabolic rate, increased leptin levels (a hormone which helps regulate hunger), short stature and low levels of lean body mass . Behavioural tendencies such as negative thinking and inattention behaviour may become barriers that prevent vital dietary and lifestyle changes to occur . Physical inactivity also increases the chance for the development of other health problems such as diabetes, increased blood pressure, dyslipidaemia, early markers of cardiovascular disease, musculoskeletal disorders, breathing difficulties with worsening of sleep apnea and psychological effects including reduced quality of life . Aerobic fitness in both youth and adults with Down syndrome is reduced compared to their peers without DS . Studies find that adolescents and young adults with DS have comparable aerobic fitness to non DS older adults (60years +) with heart disease . They also have lessened aerobic abilities, reduced muscular strength and reduced bone mineral density levels by 26% compared to their peers without DS . How Can Being Physically Active Help? Overall, strong evidence suggests that regular physical activity can lead to numerous health benefits. Can you think of any? See how many you can come up with before you check out the picture below! Participating in physical activity has a positive impact on people’s health. Benefits include improved cardiovascular, metabolic, musculoskeletal and psychosocial health profiles in people with and without DS . As previously acknowledged in the Developmental Milestones section of this page, onset of independent walking in children with Down syndrome occurs roughly 1 year later in comparison to children with typical development . It is thought that perhaps low levels of physical activity during infancy of the child with DS may contribute to this fact . Earlier walking onset has been observed in infants with Down syndrome who performed greater amounts of high intensity activity at 1 year of age . Changes to physical activity levels in infants with Down syndrome has been suggested to encourage motor development, validating the importance of early physiotherapy intervention . Promotes the development of physical and social skills. Establishes a regular routine around being physically active, leading to better habits in the future. Prevents secondary conditions associated with DS including diabetes, osteoporosis and dementia . From the evidence, it is clear that physical activity is integral to a person with Down syndrome’s health, fitness and wellbeing . If you feel unsure about what kind of activities to encourage your child to take part in, or would like to know what kind of physical activity groups are out there, then hopefully this next section will provide you with some useful information! Physiotherapists are always looking to get involved in preventative health promotion with their patients who have DS. Luckily, there are increasingly more opportunities available to improve the physical activity levels of your family member with DS. Previous group interview sessions with parents have highlighted the need for information on available physical activity interventions including individual activities as well as activities for the family . According to the World Health Organisation , the recommended daily physical activity requirements for children is at least 60 minutes of moderate to vigorous intensity daily physical activity. Your physiotherapist can help recommend specific activities suitable for your child and direct you to resources in your area! Structured accessible programs that make adaptations for children with DS have been identified as key to facilitating participation in physical activity . As well, it has been recommended that introducing diverse and interesting physical activity programmes which avoid over complicated tasks, may be more enjoyable for people with DS . Scroll to the bottom of this page to find examples of these programs in the ‘How to Get Active in the UK’ section! REMEMBER: Physical activity and exercise are the specialty of physiotherapy. If you have any questions or are still unsure, speak to your local physiotherapists. They will be able to identify the most suitable methods of physical activity or exercise to help your child! Common Worries for Parents- Can You Relate? If you are worried and feel uncertain about anything you have read, try to remember that you are not alone! Lack of information about what activities are best for their child. Cost of organised programs/not being able to afford keeping their child enrolled in them. Thoughts that their child will not remain active in the future. Motivating their child to be physically active. Unsure how to help their child avoid becoming obese. Lack of opportunities for their child to learn sporting skills . One of the most important facilitators identified for improving physical activity participation levels of people with Down syndrome is the support and motivation they receive from their family and carers . Some parents who were interviewed felt their child was more likely to be active when the physical activity was enjoyable and included being with friends or their siblings . Introducing physical activities into your child’s routine will increase familiarity and facilitate increased levels of participation . Encouraging your child to keep an activity or exercise log and organising a routine check of it alongside providing positive feedback, has previously been a suggested as a helpful method to increase motivation towards physical activity participation . Choose an activity that your child will enjoy or wants to do. Encourage childhood games that are traditional and active such as hop scotch, hide and seek or obstacle courses. Use simple ways to get your child to be more physically active in daily life such as walking to school, taking the stairs instead of the lift or walking the family dog. Keep things simple; running, jumping, dancing are great physical activities to build your child’s fitness and there are no cost requirements! You can join in yourself and get fit too! Give your child lots of positive and encouraging feedback. Be a great example yourself . Take a look at the Resources section! Information on websites and active groups that can provide fun and enjoyable opportunities for your child to partake in sport and physical activity are highlighted. Make the leap and contact someone from that list today! You never know, this simple decision may have a large impact on your child’s future. In addition to the other challenges facing people with DS, they can also experience sensory issues . Being unable to process sensory information from the environment can be both frustrating and challenging, often leading to inappropriate behaviour as a response . As humans, we use sensory information to gain experience, learn and interact with the world. When sensory feedback is limited, it can impact progress in other areas such as motor development . Physiotherapists can help with this! Do any of these behaviours seem familiar? 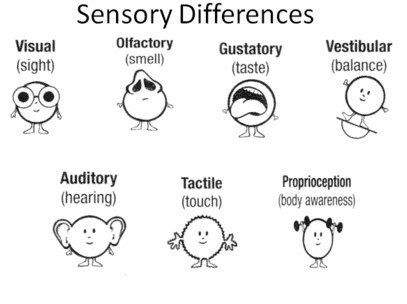 Sensory difficulties can impact your child’s behaviour and the way they interact with people and objects around them . Information from the environment is processed by our brain and can be interpreted by senses such as sound, touch and movement to mention a few. Others can be seen below in the diagram! The brain then organises this information before directing the body’s response. Typically, we are able to manage all this continuous processing without really having to think about it. People with Down syndrome aren’t always as able to sort through information, and they can quickly become overloaded and sensitive to stimuli. This is called being hyperesponsive and occurs when the brain ‘short-circuits’. Alternatively the person could become immune to stimuli, or hyporesponsive, which occurs where the brain fails to register input . It’s important to understand that people can’t always be neatly categorised into one or the other and crossover does occur. Most people enjoy a light touch from a loved one, whether a pat on the hand or a hair ruffle, and a positive response is usually expected, particularly from children. However, some people with Down syndrome can register this as dangerous and may scream or pull away. This may seem like an over-reaction to me or you perhaps but is an appropriate response according to the brain of an individual with DS. You could compare it to us walking down a scary street at night where our bodies would be on full alert. If we spent every day in this hightend state of awareness, exploring the environment may become difficult and our reaction to certain scenarios may changes. Without this exploration, it becomes challenging to learn new skills . An individual whose brain fails to register input usually bombards the sensory system, typically by constantly touching objects. Pain is not felt in a ‘typical’ manner, by crying or touching the site of pain. Instead the person may bump into the same object over and over. This may also lead to falling repeatedly. If we were in a pitch-black room and told to find a way out, we would call on our other senses – touch and sound for example. People who are hyposensitive are continuously using their brain in this intense way in order to make sense of their environment . REMEMBER: Therapies of any kind are not designed to ‘fix’ or ‘cure’ people. They are intended to help improve certain challenges a person might be facing by developing tools or skills required to achieve tasks as independently as possible! If your child or loved one is receiving sensory therapy from a physiotherapist, it would be good to talk through some of the suggested ideas to determine if they are appropriate for your family member! When brushing teeth at night, try using a vibrating toothbrush to increase tolerance of stimuli. Before doing errands, such as taking your child to the hairdressers, try giving them some chewy sweets for the different texture. Encourage participation during meal prep or baking by having your child mix ingredients of different textures or carrying pots and pans of different sizes. Allow your family member to push the trolley at the grocery and help with packing and putting food away. Drinking through a straw, a weighted lap blanket or a big squishy seat cushion can all expose your child to different sensory experiences while eating. With bathing, try out different brushes, cloths and soaps. Use crazy soap or shaving foam to draw on the wall. Try wrapping your loved one tightly in a towel and apply pressure. A hug works well, if tolerated! During playtime try playing the ‘sandwich game’ – lie the child in between two pillows so they are effectively the sandwich filling and apply pressure on top to their liking. Any home-made obstacle courses involving jumping, crawling, hopping etc. are usually fun and will be beneficial . REMEMBER: If your loved one becomes distressed by any of these activities then stop immediately and change tactics! Observe your loved one's reaction and respect it! Any indication of fear or distress is real to your child even if it appears as an over-reaction to you! Another idea is to create a ‘sensory corner’ which can be effective in reducing stress and produce a safe zone for some children. It can provide stimulation for a hyporesponsive person or create a comfortable retreat for a hyperesponsive person. Making a sensory corner is easy! Just block off a corner of a room and use soft furnishings with different textures. For example, use different carpets and pillows. Often a large beanbag or weighted blanket can provide deep pressure that can have a calming effect. Objects like lava lamps, or aquariums may be visually relaxing. Music or a sensory box filled with various objects that differ in texture and weight can be useful. Each person is unique. Have fun exploring with your loved one to determine what kind of objects and textures work the best. Click here for more sensory ideas you can try with your child! It is not uncommon for individuals with Down syndrome to experience challenges with emotional behaviours and mental health. Children with Down syndrome may have difficulties with communication skills, problem solving abilities, inattentiveness and hyperactive behaviours. Adolescents may be susceptible to social withdrawal, reduced coping skills, depression, anxiety, obsessive-compulsive behaviours and sleep difficulties. Adults with DS may have similar experiences as adolescents, with further complications of dementia later in life . Listed below are different mental health conditions. After gaining a good understanding of these you will be more familiar with approaches to assist your family member with Down syndrome to cope with these challenges in positive ways. Adolescents and adults, and sometimes children with Down syndrome may display depressive symptoms such as sadness, severe social withdrawal, or avoidance of activities that were previously enjoyable. These behaviours tend to be associated with an event that, to you, may seem like a normal life occurrence, but is perceived as a great stress to someone with Down syndrome. Such events may include the loss of a household pet, a friend or a sibling who moves away, an illness in the family, or the extended absence of a teacher. Individuals with Down syndrome can be particularly sensitive to changes in their environment and if they do not cope appropriately, this may cause significant psychological distress . Challenges may arise including withdrawal from social and physical activities, which may prolong important development in these areas and impact quality of life. There are a variety of treatment options for depression, including counselling, identifying coping methods for stressful events, medications, and participation in exercise and enjoyable activities . If your family member with Down syndrome experiences anxiety, they may display behaviours such as restlessness, panic, fidgeting or excessive worrying. Anxiety is often stimulated by transition to a new or unfamiliar situation or environment. For example, going from home to a different environment such as school, a disruption of a daily routine, or anticipation of a new event .This may prove to be a challenge when introducing new activities to individuals with DS so it is important to plan ahead and incorporate new activities gradually into the routine. Children and adults with Down syndrome have a tendency to follow familiar routines that may appear to be repetitive, compulsive or ritualistic . They may require situations to be ‘just right’ or want to participate in the same activities over and over. These behaviours are often performed to avoid feelings of anxiety . It is important to introduce physical and social activities early in life so they become part of your child’s routine. This will encourage achievement of developmental milestones. From there, creating coping strategies and planning ahead will ease your child with Down syndrome into trying new activities, as they get older. Children with Down syndrome may appear to be easily distracted, impulsive, frequently restless and they may have difficulty maintaining attention on tasks. This behaviour may persist into adulthood, however it tends to diminish with age . It often causes a barrier to participation in physical activities due to non-compliance and creates the need for increased supervision . There are medications which are said to reduce these behaviours, however they often trigger adverse side effects. Instead, it can be beneficial to channel this hyperactive energy into participating in activities that your child enjoys, or find an activity that provides a calming effect. REMEMBER: Mental health is just as important as physical health, though the signs of mental health issues may not be as obvious. Keep an eye out for any change in your child’s behaviour and don’t be afraid to ask for help! Work with a physiotherapist that has experience with individuals with intellectual disabilities. They can help to develop a behaviour treatment plan. They can also teach you about interventions designed to address specific behaviours. Take advantage of every opportunity you have to interact with others! While most people learn the majority of their social skills in school and work, people with Down syndrome need to “make every contact count”. Whether it is in therapy, school, work or at home, the opportunity to learn is everywhere! Support groups and therapies are a fantastic way of hitting two bases at once; therapy and socialising. Develop a routine and stick to it. Try using visual schedules! This method uses pictures or books to help your family member prepare for upcoming events such as beginning a new school year, going to a friend’s party or moving into a new house. Plan for difficult situations. Try using social stories! 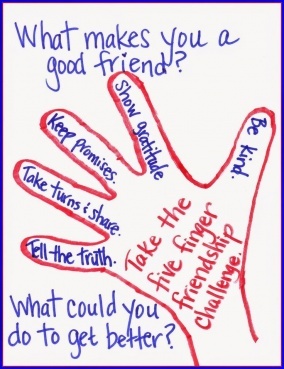 Promote positive interactions and reduce the negative ones. Make time for fun every day! Above is an example of a visual schedule. It can be fun to make one with your family member if you have the time! For further information on mental health and learning disabilities please click here, and for tips on improving the mental health of people with learning disabilities please click here. Other useful links may be found at the end of this wiki. Another challenge the brain can face for those with Down syndrome is Alzheimer’s which is the most common cause of dementia. These two terms, Dementia and Alzheimer’s, are commonly used interchangeably but are in fact different diseases. Dementia typically involves symptoms including memory loss, difficulties with thinking, problem-solving and/or language and these occur due to damage to the brain such as that caused by Alzheimer’s. REMEMBER: Down syndrome is not the same as Alzheimer’s nor does it guarantee the development of Alzheimer’s! Current estimates state that roughly 50% of people with Down syndrome will develop dementia due to Alzheimer’s as they age and symptoms only begin to show in the individuals 50s or 60s . Alzheimer’s is a physical disease of the brain caused by build-up of a protein which forms plaques or tangles. As mentioned earlier people with DS have an extra copy of chromosome 21 which carries a certain gene. This gene produces a protein called amyloid precursor protein (APP) which leads to the aforementioned plaques/tangles in many persons with DS . These plaques/tangles can cause a loss of connections between brain cells, leading to a loss in brain tissue. People with Alzheimer’s also have reduced amounts of certain chemicals in their brain which help to transmit signals in the brain, leading to less effective signal transmitting. Another aspect in which physiotherapists have recently been involved is Alzheimer’s screening programs for persons with DS. 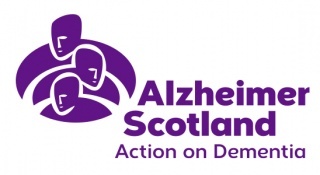 Since Alzheimer’s is so commonly associated with DS, physiotherapists along with other health professionals have begun running yearly screening clinics. These involve simple interviews and routine health checks to determine if your loved one is at risk of developing Alzheimer’s. This is a great way to keep on top of this possible problem . While there is nothing that you can do to prevent the development of Alzheimer’s, your best defence is to be aware. Take note of any changes in your loved one’s actions, memory or communication. These can be signs that something may be changing. Furthermore, preparation is also important. Taking your child to the yearly DS screening clinics will help you monitor and get early warning should they be at risk of developing the disease. Reading up on Alzheimer’s and creating a possible plan in advance may minimize future stress. The guidebook mentioned above is a great starting point. It discusses the link between Down syndrome and Alzheimer’s, the different stages, approaches to providing care and some tips on communication. You may also find the websites for the National Down syndrome Society and The Alzheimer’s Association helpful. As stated above, not everyone with Down syndrome requires physiotherapy and as with most things in life, it depends on the individual's needs. Although there is no standard treatment plan, effective physiotherapeutic management of Down syndrome typically involves a combination of sensory integration therapy, neurodevelopment treatment, perceptual-motor therapy and traditional strength and conditioning programs . Traditional therapies for conditions involving difficulties with movements can be repetitive and lack variety . People with Down syndrome often have a reduced attention span, which makes engaging in any therapy challenging, especially when dealing with children . By consistently exposing your child to different textures, sounds, environments and movements, physiotherapists make treatment more interesting and inclusive. Throughout this page we have mentioned a few less common techniques that are growing in popularity. We have described them below to help you better understand what to expect! Infancy is the ideal time to start encouraging movement and motor skills. These skills promote interaction between the child and the environment which will improve cognition, language, social skills and independence. Due to the already high risk of developmental delays in infants with DS, this is an especially important area of focus . Tummy Time in children without DS has been proven to be a positive contributor to mastering developmental milestones. This intervention has only recently been investigated specifically for children with DS. There are only a few research studies available, but results have been consistently positive. Tummy time should be started as early as possibly in infants with DS. When a child with DS begins this intervention within the first ten weeks of life, levels of motor development similar to that of half the children without DS are experienced. This technique is easily started at birth and can be performed by parents or caregivers. It is the foundation to motor skill mastery in the first year of life and increases balance, strength and skill attainment as the child grows . Further information on tummy time positions is available here. NDT is an approach which focuses on the quality of movement and coordination rather than individual muscle group function . Therefore, NDT is most effective as an early intervention, before poor compensatory patterns of movement become habitual. As physiotherapists, we can use our hands both to prevent abnormal movement patterns and to facilitate more natural ones. This hands-on approach is achieved by the physiotherapist having several ‘key points of control’, including the head, shoulders, trunk and/or pelvis to guide and alter movement . NDT is usually appropriate for people with DS as they often present with limbs and muscles that may not be as well controlled and may be floppier than desired . Although NDT will be different for every individual, a video with some examples of what a more hands-on therapy approach can look like is seen below. People with Down syndrome often struggle to process information from the environment including things like smell, touch and movement. This is known as sensory integration dysfunction. SIT aims to change how the brain interprets the environment through the very aspects in which they struggle, touch, movement and balance . The video below explains these systems and why they are important in everyday life! SIT involves a wide range of activities and equipment such as weighted vests, brushes, swings, balls, homemade obstacle courses  and even game consoles such as the Wii. These items are all used to provide some form of sensory stimulation. This interactive therapy has been shown to increase focus, reduce disruptive behaviours and improve high functioning tasks such as reading, writing and speech . If SIT is recommended for your child, it is likely that an occupational therapist (OT) will also be involved. OTs are concerned with how people manage to do meaningful activities and can help by providing equipment which ultimately aims to promote independence. Traditionally seen as more of an ‘OT thing’ understanding how sensory-based issues can impact motor performance can enhance our practice as physiotherapists, particularly when working with children. There is now a physiotherapy special interest group which offers peer support and shared learning for physiotherapists wanting to gain more experience in, and to promote the role of physiotherapy in SIT . Two Wheeled Bicycle riding helps to improve physical activity, is enjoyable and can lead to increased socialization. The skill of bicycle riding can be learned at a young age or later in life . Studies have shown that people with Down Syndrome often have reduced physical activity levels , along with reduced sports participation. Assisted two wheeled bicycle riding has been shown to reduce sedentary time and increase time participating in moderate to vigorous activity . As well, this skill has the potential to increase independence and autonomy, whilst helping to diminish their fears surrounding falling from a bike and getting hurt . If you are searching for an activity for your family to do together, that has the potential to improve your child’s quality of life , then assisted two wheeled bicycle riding could be a great activity to try out! Do you wish to enrol your child in an activity that promotes friendship, fun and progresses confidence with movement skills? Therapeutic horseback riding is a strategy that uses a horse’s motion to promote training of muscle and balance skills required for everyday life activities . While horse riding, your child will experience movements of the trunk, pelvis and hips, similar to those that would take place during normal walking . Adapting to the horse’s rhythmic movements in different directions further enhances muscle contraction, postural control, weight shifting, and planning of movement patterns . Infants with typical development learn to walk independently at about 12 months of age. Babies with Down syndrome typically learn to take independent steps at 24-28 months. These are averages, and averages & developmental milestones often feel like a ticking clock to race against. Do not fear if your child is behind the curve, as each person develops at his or her own pace. Getting your child walking is of importance as it allows interaction with the world and it is often a stepping stone to the development of other social, motor and cognitive skills. Walking allows your child to engage in other enjoyable tasks, and the endurance achieved in doing so allows your child to be active for longer periods of time! More skilled walking is less tiring for your child and could allow for more energy to take on the rest of the day. Promoting independence through walking can also leave you with free hands and ultimately will mean less work for you! Research carried out in recent years has suggested that regular walking on a treadmill can significantly improve standing and walking ability in children with DS. Put simply, different research groups have used treadmill training, with varying degrees of speed, time length and frequency and concluded that it is a beneficial intervention for development as well as physical activity . What’s great about treadmill training is that physiotherapists can prescribe it to be carried out in your own home. This allows you to work the walking practice around the family’s busy schedule and to suit your child. In addition, it promotes your involvement into your child’s development. This section includes information on popular programs that are accessible and enjoyable ways to help your child be active. As the authors of this information page are students from Queen Margaret University, Edinburgh, it was decided that information on U.K based programmes with subdivisions of Scotland would be included as resources for our readers. It is recommended for readers outside of the U.K to contact their National Down Syndrome Association and find out what groups and programs are up and running in their vicinity. The DSA has a really great website where you will be able to find endless amounts of helpful information including tips to encourage your child to become more physically active. They provide an easy to read exercise routine that can help your child get started! A link to their website is available here. This sports programme was set up in response to the awareness of the sedentary lifestyles of many children and adults with Down Syndrome and is administrated by the Down’s Syndrome Association (DSA). It currently has over 40 football sessions and 20 tennis programmes run through the UK. If you are looking for an accessible and successful way to encourage your child to take part in sports and improve not only physical fitness, but also social and emotional development, check this group out in the video below, or visit their website here. This organisation was created to provide opportunities for people with Down Syndrome to complete at a World Class level. If your child enjoys swimming, why not get in touch with the organisers and find out where your local leisure pool is situated? Click here to go to their website. The Riding for the Disabled Association (RDA) is a UK charity which provides opportunities for people of various ages and abilities to participate in horse riding therapy, led by health professionals and volunteers. RDA research has shown that after 12 weeks, riders demonstrate great improvements in physical abilities, self-confidence, communication and relationship building skills . Often the riding sessions provided are free and just require you to fill out an application form. You can visit the RDA website here for more information on how to enrol your child in therapeutic horseback riding and the many locations across the UK where it is available. Information on local Scotland groups set up for people with Down Syndrome in order to improve physical activity levels, can be found on the Down’s Syndrome Scotland website or by just following the link here. Boogie Brunch – A popular Edinburgh fortnightly group which focuses on music and dancing, with the occasion social cinema or bowling outing! Magic Stars – A Lothian group open to children ages 12 years +, which focuses on all things healthy living, healthy eating and exercise. Swimming Groups - There are numerous swimming groups for your child to join in the West of Scotland, and there is a recommended contact on the above website if you are interested and would like more information. Fabb Scotland- This organisation enables children and young people with disabilities to access sporting, leisure, social activities as well as outdoor adventures. Visit their website here. The Yard- The Yard is an award-winning charity running adventure play services for disabled children, young people and their families. In the east of Scotland, they offer disabled children and their siblings the chance to experience fun, adventurous indoor and outdoor play in a supported environment. Promoting physical development and social interactions, The Yard offers emotional as well as practical support for families. See their website for further info here. Although not a Physiotherapy issue as such, it’s worth mentioning that the social lives of persons with Down syndrome can be very different from others. Managing many of the physiotherapy issues mentioned above requires time and effort spent in therapy and carrying out home practice. As a result, persons with DS often find themselves meeting and interacting with their peers less often than non-DS persons. This is something to consider as meeting others is important for developing social and life skills. Becoming an adult can be confusing and difficult for everyone, especially for people with caring needs or intellectual disabilities (ID). When a person with DS gets older they are transferred from children’s services to adult care. The exact age may change depending on the service or area you are located in. This transition is often accompanied by a change in physiotherapist, services available and a disruption to routine. It is often a stressful time and has historically been an issue for service users. In an attempt to correct this, several pieces of legislation have been set out by the UK government. Does This Make the Transition Perfect? Despite numerous government legislations and guidance, research strongly says that there continues to be a marked variation in the arrangements available for the transition from child to adult services . In order to combat this, some further steps have been taken. Increased collaboration between Child and Adolescent Mental Health Services (CAMHS) and adult intellectual disability services. Different services are unique in their structures and philosophies – if there was more integration between services and increased awareness of each other’s role, a more uniform and continuous service could be provided . How Can You Make the Transition Easier? 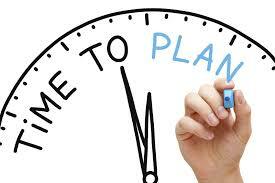 Make a plan with your physiotherapist well ahead of time. Ask for advice on adult services prior to transitioning. Set a date for the transition to occur. Ask you physiotherapist to conduct a joint session between new and old services to ease the transition for service providers and your loved one. Include your loved one with DS in the transition decisions . It’s perfectly natural to have concerns, everyone does! The information below has been pulled from a recent study  investigating what parents of children with learning disabilities thought after professional intervention, its impact on their children and how it affected their lives overall. “Another mother, Janet, worried that her son "was just so incredibly far behind his classmates. He was so taken up with the basic tasks that he couldn’t get on to doing anything fun.”"
"It made us less frantic about trying to fit into mould of a child that doesn’t exist. And it made us all more accepting of her behaviors....It helped us try to work with her needs and not just our needs for her....I began to understand her needs. That was important. Psychologically she was getting hurt because she was thinking she was a bad person....My child was incredibly happier as a result, and that was a really important measurement for me." REMEMBER: These feelings are completely normal and felt by members of many families with a member who has DS. You are not alone in your feelings! Much research has been done on family dynamics and though results are often unclear, recent investigation is revealing that the increased levels of stress and decreased levels of well-being are evident in parents with a child who has DS for a variety of reasons. Demanding parenting roles, concerns over your family member’s social acceptability and decreased confidence in parenting skills are just a few contributors to high stress levels in parents of persons with DS . You may feel as though you can handle stress, but it can often lead to poorer physical health and depression, which has shown to have detrimental effects on both individuals and families. For this reason, it is important for you and your other family members to take time to focus on yourself. As a caregiver, if you are stressed, worried or unsatisfied, it can negatively impact your health, your child’s health and your family unit. Never forget that you are important too! 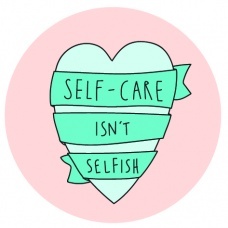 Taking time for yourself will improve both your personal mental health and your families’ overall well being. Though these small things may seem insignificant they can have a dramatic effect on how you feel and the cohesiveness of your family unit . This will lessen the stress felt by each member of your family. Lower levels of stress has also been shown to increase satisfaction in your parenting role which further decreases stress levels. Keeping a strong bond with your spouse or main support leads to less depressive symptoms and increased parental confidence . While your focus might be on supporting your loved one with DS, you too must strive to live an enriched life! Luckily there is a host of services available to help you achieve this! Support for you can come in many forms. Respite care for your loved one, skills workshops to make caring less strenuous or support groups for you to exchange ideas with others are common resources. The Down Syndrome Association and Down Syndrome Scotland also offer services specific to carers of persons with DS. They offer parental workshops on effective communication, behaviour analysis, manual handling and a host of useful topics. Again these workshops offer a great opportunity to meet other carers and parents of persons with DS. Check out the Downs Syndrome organisation map of local support groups here or Down Syndrome Scotland here. Exceptional Parents: An organisation that publishes a monthly magazine and maintains online resources to provide practical advice, emotional support and up-to-date information to the parents of special needs children. Parenting Special Needs: Another organisation that publishes an online magazine designed to bring inspiration and information the parents of children with special needs. Representation of persons with DS in the media is vital as it promotes public awareness of this unique group of people. It also allows persons with DS to be represented as individuals rather than groups or a stereotype. In the past, the DS population has been under represented in the media, but there are signs that things are starting to change. The BBC’s video, ‘Things People with Downs-Syndrome are Tired of Hearing’, is an excellent example of how the media can challenge how the public views people with DS. It highlights that although attitudes are changing, persons with DS still find themselves subject to some really patronising questions. Common misconceptions are discussed, and sensitive topics approached. This resource is a great educational tool that will help open the minds of those who are unfamiliar with this special population. Also in recent years, DS has become more visible in popular culture. A recent reality TV show called ‘Born this Way’ has won awards in 2017 and 2018 for its portrayal of young adults born with Down syndrome. The brave cast is filmed as they grow and learn about friendships, romance and jobs. It shows a unique perspective of the DS population to the general public and will contribute to increasing awareness of the capabilities and challenges of a person with DS. In this show, the parents are also filmed and they discuss the challenges and the joys that they experience with their child. Another show entitled ‘THE SPECIALS’ has won acclaim for its presentation of young adults with intellectual disabilities. It portrays the lives of a group of young people who are transitioning into adulthood and striking out on their own. Stories of love and friendship, dating, job hunting etc through the eyes of the cast, create educational and interesting episodes . There are many other shows on regular TV which feature actos with DS. 'Glee', 'American Horror Story' and 'Life Goes On' are just a few examples. It may benefit both yourself and your child to watch some of these programmes and recognize that there are no limits on what a person with DS can achieve! Another area DS is visible in the media is through campaigns. Many associations run campaigns to promote DS awareness and campaign for required services. One example of this is the ‘Don't Screen Us Out’ campaign that was launched in response to the UK governments plans to offer increasingly advanced screening tools to mothers to screen for DS. The group suggests that with the implementation of a new non-invasive prenatal test, the number of children born with DS may decrease . This campaign helps to identify the negative consequences of the new screening tests. By screening out people with DS before they are born the campaign asserts that the government is enabling selective elimination, promoting lack of inclusion and violating ethical obligations to disabled people. Down syndrome groups often educate the community while fundraising. 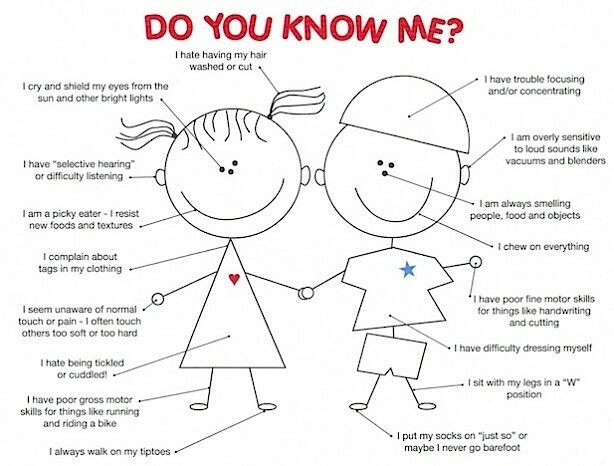 This can be seen through the implementation of ‘Down syndrome Awareness Week’ and ‘World Down syndrome Day’. A diagnosis of DS can be a worrisome time for families. It is often unexpected and can be difficult to modify your expectations for your child. In this wiki we consolidated available information into one resource to facilitate learning. The first obstacle tackled was expectation. Differences between DS populations and non-DS populations were discussed in terms of motor skills, and common challenges facing individuals with DS were addressed. We hope this has allowed you to envision a realistic future for your family. 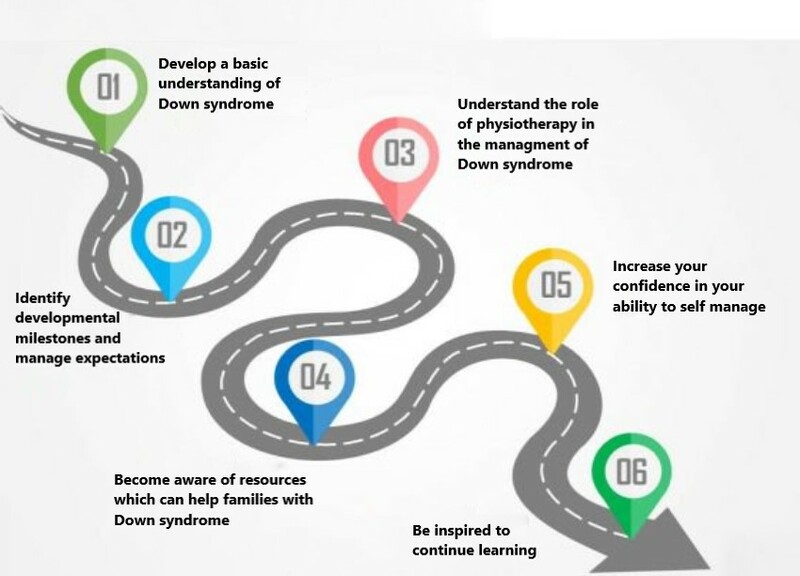 We wanted to emphasise the vital role that physiotherapy has to play in the care and management over the lifespan of a person with Down syndrome. From birth, physiotherapy interventions aim to aid in development and provide an essential foundation for the individual with DS. Whether it is assisting in learning skills for everyday life, or working through particular challenges, physiotherapy attempts to make life easier. As the individual grows, and new challenges arise, physiotherapists are available to provide advice and help you and your child overcome any problem that you may face. Some challenges discussed were balance, strength, levels of physical activity, sensory and memory difficulties, mood and mental health. We also tried to provide you with a variety or resources throughout the wiki to aid allow you to investigate any specific areas of interest you may have. Finally, we hope you have realised that you are important too. Though your child may require a significant amount of attention, it is vital that you look after your own mental and physical health as well. Numerous tips and support groups options have been provided. Overall, the goal of this page was to enlighten you to the complexities of Down syndrome, inform you of the role of physiotherapy in managing these challenges, and help you understand your child’s potential. It is our hope that you feel encouraged, supported and confident in your ability to care for your family member with DS. ALWAYS REMEMBER: Your child is a unique individual. An approach that works for another child may not work for yours. You are not alone when faced with these challenges. Physiotherapists are here to help! We realise that this resource was developed with a large emphasis on the role of physiotherapy in the management of Down syndrome. It is likely that you have other questions which have not been answered on this page. Below are links to external websites which we hope will aid in answering any lingering questions. ↑ 1.0 1.1 1.2 1.3 1.4 National Down Syndrome Society. Down syndrome fact sheet. www.ndss.org/wp-content/uploads/2017/08/NDSS-Fact-Sheet-Language-Guide-2015.pdf (accessed 14 March 2018). ↑ Cipriani G, Danti S, Carlesi C, Fiorino M. Aging with down syndrome: the dual diagnosis: alzheimer's disease and down syndrome. American Journal of Alzheimer's Disease and Other Dementias 2018. www.journals.sagepub.com/doi/pdf/10.1177/1533317518761093 (accessed 14 March 2018). ↑ Carr J, Collins S.. 50 years with down syndrome: a longitudinal study. Journal of Applied Research in Intellectual Disabilities 2018. https://www.ncbi.nlm.nih.gov/pubmed/29498451 (accessed 14 March 2018). ↑ Zhu J, Hasle H, Correa A, Schendel D, Friedmant J, Olsen J, Ramussen S. Survival among people with down syndrome. Genetics in Medicine 2013;15:64-69. https://www.nature.com/articles/gim201293 (accessed 12 March 2018). ↑ Allerton L, Emerson E. British adults with chronic health conditions or impairments face significant barriers to accessing health services. Public Health 2012;126:920-927. https://www.ncbi.nlm.nih.gov/pubmed/22959282 (accessed 13 March 2018). ↑ National Health Service. Promoting access to healthcare for people with a learning disability. www.jpaget.nhs.uk/media/186386/promoting_access_to_healtcare_for_people_with_learning_disabilities_a_guide_for_frontline_staff.pdf (accessed 14 March 2018). ↑ Menear, K. Parents perceptions of health and physical activity needs of children with Down syndrome. Down Syndrome Research 2007;12:60-68. https://library.down-syndrome.org/en-gb/research-practice/12/1/parents-perceptions-health-physical-activity-needs-down-syndrome/ (accessed 12 April 2018). ↑ National Down Syndrome Society. What is down syndrome. London: NDSS. https://www.ndss.org/about-down-syndrome/down-syndrome/ (accessed 19 March 2018). ↑ Newton R, Marder L, Puri S. Down syndrome: current perspectives. London: Mac Keith Press. https://ebookcentral.proquest.com/lib/qmu/detail.action?docID=3329189 (accessed18 March 2018). ↑ Kami T. Signs of Down Syndrome. 2008. [Picture]. www.womens-health-advice.com/photos/down-syndrome.html (accessed18 March 2018). ↑ Mazeurek D, Wyka J. Down syndrome: genetic and nutritional aspects of accompanying disorders. Roczniki Panstwowego Zakladu Higieny 2015;66:189-194. https://www.ncbi.nlm.nih.gov/pubmed/26400113 (accessed 17 March 2018). ↑ 12.0 12.1 National Human Genome Research Institute. Learning about Down syndrome. 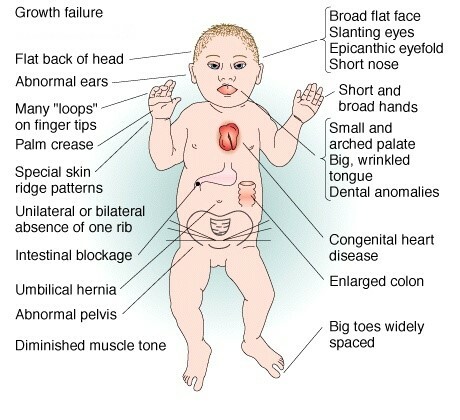 https://www.genome.gov/19517824/learning-about-down-syndrome/ (accessed 16 March 2018). ↑ 13.0 13.1 Sacks B, Buckley S. What do we know about the movement abilities of children with down syndrome. Down Syndrome News and Updates 2003;2:131-141. https://library.down-syndrome.org/en-gb/news-update/02/4/movement-abilities-down-syndrome/ (accessed18 March 2018). ↑ Down Syndrome Limerick. Different types of down syndrome. https://www.downsyndromelimerick.ie/services/new-parents/types-of-down-syndrome (accessed 17 March 2018). ↑ British Institute of Learning Disabilities. Supporting older people with learning disabilities. https://www.ndti.org.uk/uploads/files/9354_Supporting_Older_People_ST3.pdf (accessed 18 March 2018). ↑ Cruzado D, Vargas, A. Improving adherence physical activity with a smartphone application based on adults with intellectual disabilities. BMC Public Health. 2013;13:1173. https://bmcpublichealth.biomedcentral.com/articles/10.1186/1471-2458-13-1173 (accessed 11 March 2018). ↑ CSP. What is physiotherapy. 2018. www.csp.org.uk/your-health/what-physiotherapy (accessed 14 April 2018). ↑ CSP. Learning disabilities physiotherapy. Associated of Chartered Physiotherapists for People with Learning Disabilities. www.acppld.csp.org.uk/learning-disabilities-physiotherapy (accessed13 March 2018). ↑ Middleton J, Kitchen S. Factors affecting the involvement of day centre staff in the delivery of physiotherapy to adults with intellectual disabilities. Journal of Applied Research in Intellectual Disabilities 2008:21:227-235. www.onlinelibrary.wiley.com/doi/10.1111/j.1468-3148.2007.00396.x/epdf (accessed 11 March 2018). ↑ 20.0 20.1 Layton T. Developmental Scale for Children with Down Syndrome. North Carolina: Extraordinary Learning Foundation. www.dsacc.org/downloads/parents/downsyndromedevelopmentalscale.pdf (accessed 20 March 2018). ↑ Kim H, Kim S, Kim J, Jeon H, Jung D. Motor and cognitive developmental profiles in children with down syndrome. Annals of Rehabilitation Medicine 2017;41:97-103. https://www.ncbi.nlm.nih.gov/pmc/articles/PMC5344833/ (accessed 21 March 2018). ↑ National Down Syndrome Society. 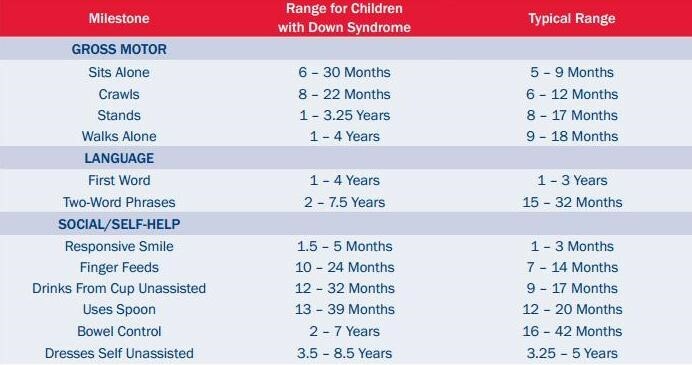 Down Syndrome Developmental Milestones. 2009. [Picture]. https://www.ndss.org/resources/early-intervention/ (accessed 12 March 2018). ↑ Down Syndrome Medical Interest Group. PCHR insert for babies born with Down syndrome. Nottingham: Down Syndrome Medical Interest Group. www.healthforallchildren.com/wp-content/uploads/2013/04/A5-Downs-Instrucs-chartsfull-copy.pdf (accessed 21 March 2018). ↑ Frank K, Esbensen A. Fine motor and selfcare milestones for individuals with down syndrome using a retrospective chart review. Journal of Theoretical Social Psychology. 2015;89:719-729. https://onlinelibrary.wiley.com/doi/abs/10.1111/jir.12176 (accessed 20 March 2018). ↑ Georgescu M, Cernea M, Balan V. Postural control in down syndrome subjects. The European Proceedings of Social and Behavioural Sciences. www.futureacademy.org.uk/files/images/upload/ICPESK%202015%2035_333.pdf (accessed 17 March 2018). ↑ 26.0 26.1 26.2 Malak R, Kostiukow A, Wasielewska A, Mojs E, Samborski W. Delays in motor development in children with down syndrome. Medical Science Monitor 2015;21:1904-1910. https://www.ncbi.nlm.nih.gov/pmc/articles/PMC4500597/ (accessed18 March 2018). ↑ Costa A. An assessment of optokinetic nystagmus in persons with down syndrome. Experimental Brain Research 2011;8:110-121. https://www.sciencedaily.com/releases/2011/08/110824142850.htm (accessed17 March 2018). ↑ Saied B, Hassan D, Reza B. Postural stability in children with down syndrome. Medicina Sportiva 2014;1:2299-2304. https://search.proquest.com/docview/1510494760/fulltextPDF/6606B032D8C04A9EPQ/1?accountid=12269 (accessed19 March 2018). ↑ Clique Images. Yoga for Girls with Down syndrome. 2015. [Picture]. 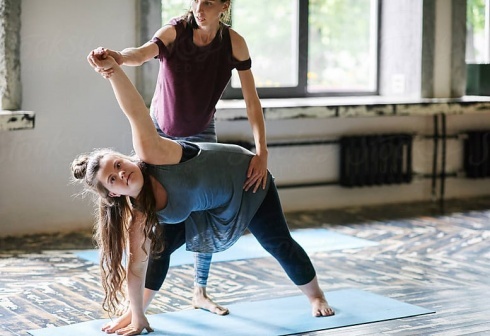 https://www.stocksy.com/1490017/yoga-for-girls-with-down-syndrome (accessed 21 March 2018). ↑ NHS. Balance Exercises. https://www.nhs.uk/Livewell/fitness/Pages/balance-exercises-for-older-people.aspx (accessed 20 March 2018). ↑ Down Syndrome Awareness. Our beautiful son with Down syndrome at Physical Therapy [Video]. 2011. https://www.youtube.com/watch?v=T6Mmv0-ShHU(accessed 15 March 2018). ↑ Gupta S, Rao B, Kumaran S. Effect of strength and balance training in children with down syndrome: a randomized control trial. Clinical Rehabilitation 2011;25:425-432. www.journals.sagepub.com/doi/pdf/10.1177/0269215510382929 (accessed 19 March 2018). ↑ Welsh TN, Elliot D. The processing speed of visual and verbal movement information by adults with and without Down syndrome. Adapted Physical Activity Quarterly 2001;18:156-167. ↑ Cowley P, Ploutz-Snyder L, Baynard T, Heffernan K, Jae S, Hsu S. Physical fitness predicts functional tasks in individuals with Down syndrome. Med Sci Sports Exercise 2010;42:388-393. ↑ Mercer V, Stemmons V, Cynthia L. Hip abductor and knee extensor muscle strength of children with and without Down’s syndrome. Phys Ther 2001;1318-26. ↑ Down Syndrome Society. 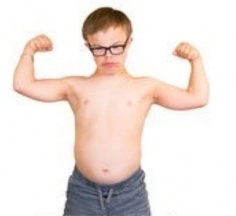 Boy with Down syndrome Flexing. 2017. [Picture]. ↑ Merrick J, Ezra E, Josef B, Endel D, Steinberg D, Wientroub S. Musculoskeletal problems in Down syndrome. Israeli J Pediatr Orthop 2000;9:185-192. ↑ Spruit M, Gosselink R, Trooster T. Resistance vs endurance training in patients with COPD and peripheral muscle weakness. Eur Respir J 2002;19:1072-1078. ↑ Croce R, Pitetti K, Horvat M. Peak Torque, average power, and hamstrings/quadriceps ratios in nondisabled adults and adults with mental retardation. Arch Phys Med Rehabil 1996;77:369-372. ↑ Lewis C, Fragala-Pinkham M. Effects of aerobic conditioning and strength training on a child with Down syndrome: a case study. Pediatric Physical Therapy 2005;17:30-36. ↑ 42.0 42.1 42.2 Esposito PE, MacDonald M, Hornyak JE, Ulrich DA. Physical activity patterns of youth with Down syndrome. Intellectual and developmental disabilities 2012 Apr;50(2):109-19. ↑ Phillips AC, Holland AJ. Assessment of objectively measured physical activity levels in individuals with intellectual disabilities with and without Down's syndrome. PLoS One 2011 Dec 21;6(12):e28618. ↑ Shields N, Dodd KJ, Abblitt C. Do children with Down syndrome perform sufficient physical activity to maintain good health? A pilot study. Adapted Physical Activity Quarterly. 2009 Oct;26(4):307-20. ↑ 45.0 45.1 45.2 45.3 Buckley S. Increasing opportunities for physical activity. Down Syndrome Research and Practice 2007;12:18-19. ↑ 48.0 48.1 48.2 Shields N, Blee F. Physical activity for children with Down syndrome. 2012. ↑ 49.0 49.1 49.2 49.3 49.4 Barr M, Shields N. Identifying the barriers and facilitators to participation in physical activity for children with Down syndrome. Journal of Intellectual Disability Research. 2011 Nov 1;55(11):1020-33. ↑ Rimmer JH, Yamaki K, Davis BM, Wang E, Vogel LC. Peer reviewed: Obesity and overweight prevalence among adolescents with disabilities. 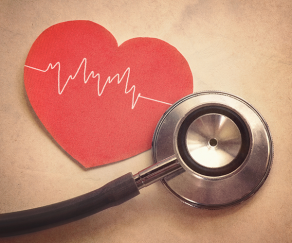 Preventing chronic disease. 2011 Mar;8(2). ↑ Basil JS, Santoro SL, Martin LJ, Healy KW, Chini BA, Saal HM. Retrospective study of obesity in children with Down syndrome. The Journal of pediatrics. 2016 Jun 1;173:143-8. ↑ Bull MJ. Health supervision for children with Down syndrome. 2011. ↑ 53.0 53.1 53.2 Artioli T. Understanding Obesity in Down’s Syndrome Children. Journal of Obesity and Metabolism. 2017 1: 101. ↑ Mendonca GV, Pereira FD, Fernhall BO. Reduced exercise capacity in persons with Down syndrome: cause, effect, and management. Therapeutics and clinical risk management. 2010;6:601. ↑ 55.0 55.1 Baynard T, Pitetti KH, Guerra M, Unnithan VB, Fernhall B. Age-related changes in aerobic capacity in individuals with mental retardation: a 20-yr review. Medicine and science in sports and exercise. 2008 Nov;40(11):1984-9. ↑ Angelopoulou N, Matziari C, Tsimaras A, Sakadamis V, Mandroukas K. Bone mineral density nd muscle strength in young men with mental retardation. Calcified Tissue International 2000;66:176-180. ↑ Rowland T. Physical activity, fitness, and children. 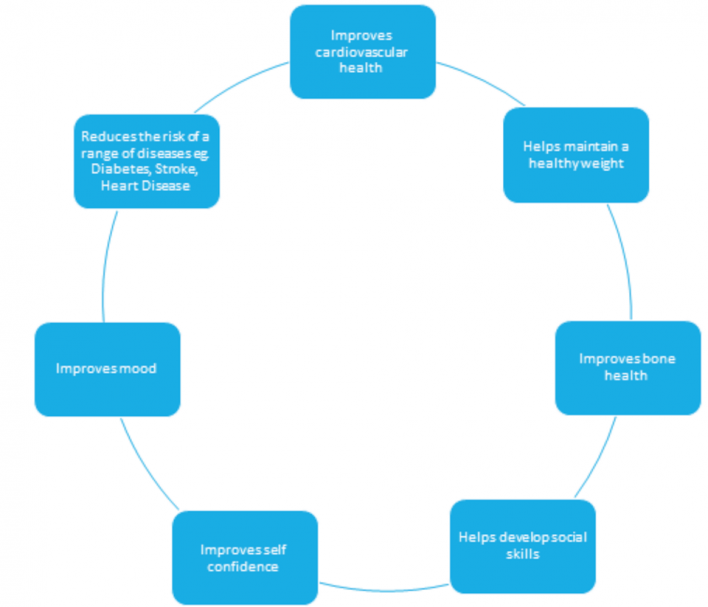 Physical activity and health. 2007:259-70. ↑ Ulrich BD, Ulrich DA. Spontaneous leg movements of infants with Down syndrome and nondisabled infants. Child development. 1995 Dec 1;66(6):1844-55. ↑ 59.0 59.1 59.2 Pitetti H, Baynard T, Agiovlasitis S. Children and adolescents with Down syndrome, physical fitness and physical activity. Journal of Sport and health Science 2013;2:47-57. ↑ Lloyd M, Burghardt A, Ulrich DA, Angulo-Barroso R. Physical activity and walking onset in infants with Down syndrome. Adapted Physical Activity Quarterly. 2010 Jan;27(1):1-6. 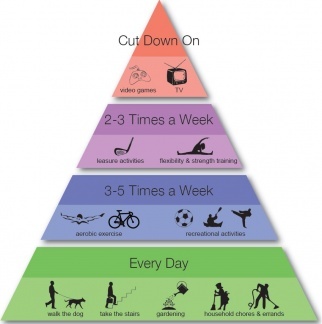 ↑ LifeSpan .Physical Activity Pyramid. 2015. [Picture]. ↑ 62.0 62.1 62.2 Ulrich DA, Burghardt AR, Lloyd M, Tiernan C, Hornyak JE. Physical activity benefits of learning to ride a two-wheel bicycle for children with Down syndrome: a randomized trial. Physical therapy. 2011 Oct 1;91(10):1463-77. ↑ Rimmer JH, Heller T, Wang E, Valerio I. Improvements in physical fitness in adults with Down syndrome. American Journal on Mental Retardation. 2004 Mar;109(2):165-74. ↑ Seron BB, Modesto EL, Stanganelli LC, Carvalho EM, Greguol M. Effects of aerobic and resistance training on the cardiorespiratory fitness of young people with Down Syndrome. Revista Brasileira de Cineantropometria & Desempenho Humano. 2017 Aug;19(4):385-94. ↑ 65.0 65.1 Heller T, Hsieh K, Rimmer JH. Attitudinal and psychosocial outcomes of a fitness and health education program on adults with Down syndrome. American Journal on Mental Retardation. 2004 Mar;109(2):175-85. ↑ Shields N. Getting Active: What Does it Mean for Children With Down Syndrome?. 2016. ↑ 67.0 67.1 67.2 67.3 Menear K. Parents’ perceptions of health and physical activity needs of children with Down syndrome. Down Syndrome Research and Practice. 2007 Jul 30;12(1):60-8. ↑ World Health Organisation. Global recommendations on physical activity for health. 2017. www.who.int/dietphysicalactivity/factsheet_recommendations/en/ (accessed 28 March 2018). ↑ Mahy J, Shields N, Taylor NF, Dodd KJ. Identifying facilitators and barriers to physical activity for adults with Down syndrome. Journal of Intellectual Disability Research. 2010 Sep 1;54(9):795-805. ↑ 71.0 71.1 BruniI M.. Fine motor skills for children with Down syndrome. 2nd ed. Bethesda: Woodbine House Inc., 2006. ↑ 72.0 72.1 Lashno M. Sensory integration: observations of children with Down syndrome and Autistic spectrum disorders. Disability Solutions 1999;3:31-35. ↑ Scott R. Do you know me. 2015. [Picture]. https://psychprofessionals.com.au/sensory-processing-problem/ (accessed 12 April 2018). ↑ 74.0 74.1 74.2 Lashno M. Mixed signals: understanding and treating you child’s sensory processing issues. Baltimore: Woodbine House Inc, 2010. ↑ Smith-Myles B. Seven Senses. 2000. [Picture].http://blog.birdhousehq.com/sensory-integration-dysfunction-101/ (accessed 15 April 2018). ↑ Star Institute. Home activities for sensory processing disorders. https://www.spdstar.org/basic/home-activities (accessed 23 March 2018). ↑ Van Germeren-Oosterom H, Fekkes M, Buitendijk S, Mohangoo A, Bruil J, Van Wouwe J. Development, problem behaviour, and quality of life in a population based sample of eight-year-old children with Down syndrome. Plos One 2011;6:7. ↑ 78.0 78.1 National Down Syndrome Society. Mental health issues and Down syndrome. https://www.ndss.org/resources/mental-health-issues-syndrome/ (accessed 30 March 2018). ↑ 79.0 79.1 National Down Syndrome Association. For families and carers: depression. https://www.downs-syndrome.org.uk/for-families-and-carers/health-and-well-being/depression-2/ (accessed 02 April 2018). ↑ Evans D, Canavera K, Kleinpeter F, Maccubbin E, Taga K. The fears, phobias and anxieties of children with autism spectrum disorders and Down syndrome: comparisons with developmentally and chronologically age matched children. Child Psychiatry and Human Development 2005;36:3-26. ↑ Glenn S, Cunningham C, Nananidou A, Prasher V, Glenholmes P. Routinised and compulsive-like behaviours in individuals with Down syndrome. Journal of Intellectual Disability Research 2015;59:1061-1070. ↑ Selikowitz M. Down syndrome the facts. 2nd ed. Oxford: Oxford University Press, 1997. ↑ 83.0 83.1 Stein D. Behaviour and Down syndrome: a practical guide for parents. Boston: Children’s Hospital Boston, 2002. ↑ NHS Leicestershire. Mental Health and Learning Disabilities. https://www.rcpsych.ac.uk/pdf/Depression%20ld%20final.pdf (accessed 25 March 2018). ↑ Burke CK. Feeling down: improving the mental health of people with learning disabilities. https://www.mentalhealth.org.uk/sites/default/files/feeling-down-report-2014.pdf (accessed 4 April 2018). ↑ National Institute on Ageing. Alzheimer’s disease in people with Down syndrome. https://www.nia.nih.gov/health/alzheimers-disease-people-down-syndrome accessed 23 March 2018). ↑ National Down syndrome Society. Aging and Down syndrome: a health and well being guidebook. www.ndss.org/wp-content/uploads/2017/11/Aging-and-Down-Syndrome.pdf (accessed 5 April 2018). ↑ Barnhart R, Connolly B. Agining and Down syndrome: implications for physical therapy. Physical Therapy 2007;87:1399-1406. https://academic.oup.com/ptj/article/87/10/1399/2742283 (accessed 28 March 2018). ↑ Backer C, Jervis N. A screening programme for adults with Down syndrome. Nursing Times 2007;10. https://www.nursingtimes.net/a-screening-programme-for-adults-with-downs-syndrome/199994.article (accessed 5 April 2018). ↑ Down Syndrome Association. For Families and Carers. https://www.downs-syndrome.org.uk/for-families-and-carers/ (accessed 6 April 2018). ↑ 91.0 91.1 91.2 Wuang YP, Chiang CS, Su CY, Wang C. Effectiveness of virtual reality using Wii gaming technology in children with Down syndrome. Res Dev Disabil 2011;32:312-321. ↑ Lott I, Dierssen M. Cognitive deficits and associated neurological complications in individuals with Down syndrome. Lancet Neurol. 2010;9:623-633. ↑ 93.0 93.1 Wentz R. The impact of an early and intense prone positioning program in infants with and without Down syndrome. The University of Michigan 2016. https://deepblue.lib.umich.edu/bitstream/handle/2027.42/133421/erinengw_1.pdf?sequence=1&isAllowed=y (accessed 22 March 2018). ↑ Wentz E. Importance of initiating a tummy time intervention early in infants with down syndrome. Paediatric Physical Therapy 2017;29:68-75. https://journals.lww.com/pedpt/Fulltext/2017/01000/Importance_of_Initiating_a__Tummy_Time_.20.aspx?WT.mc_id=HPxADx20100319xMP (accessed viewed 18 March 2018). ↑ Wentz E. Tummy Time Positions. 2017. [Picture]. https://journals.lww.com/pedpt/Fulltext/2017/01000/Importance_of_Initiating_a__Tummy_Time_.20.aspx?WT.mc_id=HPxADx20100319xMP (accessed viewed 18 March 2018). ↑ Durkin A. Tummy Time. www.dsdaytoday.blogspot.co.uk/2011/03/tummy-time.html (accessed 6 April 2018). ↑ 97.0 97.1 Velickovic TD, PERAT MV. Basic principles of the neurodevelopmental treatment. Medicina 2005;42:112-120. ↑ 98.0 98.1 Smith J, Weaver L, Fristad M. A systematic review of sensory integration training interventions for children with Down syndrome. Sage Journals 2015;5:10-14. ↑ Zimmer M, Desch L. Sensory integration therapies for children with developmental and behavioural disorders. Paediatrics 2012;129:1186-1189. https://www.ncbi.nlm.nih.gov/pubmed/22641765 (accessed 7 April 2018). ↑ Sensory integration education. About us. 2013. https://www.sensoryintegration.org.uk/About-us (accessed19 April 2018). ↑ Ringenbach S, Holzapfel G, Mulvey A, Jimenez A, Benson S, Richter M. The effects of assisted cycling therapy and voluntary cycling on reaction time and measures of executive function in adolescents with Down syndrome. JIDR 2016;60:1073-1080. ↑ 102.0 102.1 Giagazoglou P, Arabatzi F, Dipla K, Liga, M, Kellis E. Effect of a hippotherapy intervention program on static balance and strength in adolescents with intellectual disabilities. Res Dev Disabil 2012;33:2265-2270. ↑ Winchester P, Kendall L, Peters H, Sears N, WINKLEY T. The effect of therapeutic horseback riding on gross motor function and gait speed in children who are developmentally delayed. Physical and Occupational Therapy in Pediatrics 2002;22:37-50. ↑ 104.0 104.1 Champagne D, Dugas C. Improving gross motor function and postural control with hippotherapy in children with Down syndrome: case reports. Physiotherapy Theory Practice 2010;26:564-571. ↑ 105.0 105.1 Ulrich DA, Ulrich BD, Angulo-Kinzler RM, Yun J. Treadmill training of infants with Down syndrome: evidence-based developmental outcomes. Pediatrics. 2001;108(5):85. ↑ Riding for the Disabled Association. Therapy Through Horse. http://www.rda.org.uk/runningyourgroup/therapy/ (accessed 19 March 2018). ↑ Blue Hippo Group .Plan Ahead. 2015. [Picture]. ↑ 108.0 108.1 Social Development Ireland. Social Development. 2017. https://downsyndrome.ie/social-development-behaviour/ (accessed 25 March 2018). ↑ SCIE. The Road Ahead. https://www.scie.org.uk/publications/tra/index.asp . (accessed 30 March 2018). ↑ Her Majesty’s Stationery Office. Education Act and associated Code of Practice. London: HMSO, 1993. ↑ Slopper P, Beecham J, Clarke S, Franklin A, Moran N, Cusworth L. Models of multi-agency services for transition to audit services for disabled young people and those with complex health needs: impacts and cost. University of York: Social policy research unit. https://kar.kent.ac.uk/32459/2/transitions%5B1%5D.pdf (accessed 30 March 2018). ↑ Singh P, Paul M, Ford T, Kramer T, Weaver T, Mclaren S, Hovish K, Islam Z, Belling R, White S. Process, outcome and experience of transition from child to adult mental healthcare: multiperspective study. The British Journal of Psychiatry 2010;197:305-312. ↑ Viner R. Transition from paediatric to adult care. Bridging the gaps or passing the buck. British Medical Journal 1999;81:3. www.adc.bmj.com/content/81/3/271 (accessed 14 March 2018). ↑ Cohn E.S.. Parent perspectives of physiotherapy using a sensory integration approach. Am J Occup Ther 2001;55:285-294. ↑ Cuskelly M, Cram P, Ruper M. Families of children with down syndrome: what we know and what we need to know. Down Syndrome Research and Practice 2008. https://library.down-syndrome.org/en-gb/research-practice/online/2008/families-down-syndrome-what-need/ (accessed 25 March 2018). ↑ Most D, Fidler D, Booth C, Kelly J. Stress trajectories in mothers of young children with Down syndrome. Journal of Intellectual Disability Research 2006;50:501-514. https://www.ncbi.nlm.nih.gov/pubmed/16774635 (accessed 24 March 2018). ↑ Cram P, Warfield M, Shonkoff J, Krauss M. Children with disabilities: A longitudinal study of child development and parent well-being. Monographs of the Society for Research in Child Development 2001;66:266. https://www.ncbi.nlm.nih.gov/pubmed/11677873 (accessed 26 March 2018). ↑ Norton A. Families of children with down syndrome report mostly positive experiences. Chicago Tribune 2016. www.chicagotribune.com/lifestyles/health/sc-down-syndrome-health-0330-20160322-story.html (accessed 27 March 2018). ↑ Raeside J. The Specials review- its more than a TV show, its a voice for unrepresented young people. The Gaurdian. 2017. https://www.theguardian.com/tv-and-radio/2017/oct/26/the-specials-review-brilliant-docusoap-special-needs (accessed 25 March 2018). ↑ Dont Screen Us Out. 2014. [Picture].www.binocar.org/content/annrep2013_FINAL_nologo.pdf (accessed 15 April 2018). ↑ Morris J, Springett A. The Naational Down Syndrome Cytogenetic Register. 2014. www.binocar.org/content/annrep2013_FINAL_nologo.pdf (accessed 15 April 2018). BBC Three. Things people with down syndrome are tired of hearing [Video]. 2016. https://www.youtube.com/watch?v=AAPmGW-GDHA (accessed 16 March 2018). Tedx Talks. I have one more chromosome. So what? [Video]. 2015. https://www.youtube.com/watch?v=HwxjoBQdn0s (accessed 12 March 2018). Pathways Awareness. Importance of Sensory Integration [Video]. 2013. https://www.youtube.com/watch?v=1_Iuj8dr9oY&feature=youtu.be (accessed 28 March 2018). Evexia Rehabilitation Center. NDT-Bobath Method [Video]. 2017. https://www.youtube.com/watch?v=xDUvmhaYr98&feature=youtu.be (accessed 4 April 2018). Sanctuary PTPS. Perceptual Motor Program [Video]. 2014. https://www.youtube.com/watch?v=222WIhX4dV0&feature=youtu.be (accessed 24 March 2018). University of Michigan School of Kinesiology. Baby Treadmill [Video]. 2009. https://www.youtube.com/watch?v=4CTYIBz-IPI (accessed 2 April 2018).